With the world’s best horses and riders in action at every leg of the Longines Global Champions Tour and GCL Championship race, it’s easy to forget it’s a long road to the top. Chances are, if you’re a lover of all things equestrian it probably started off with a cheeky, ‘aww’-inducing pony somewhere along the way. 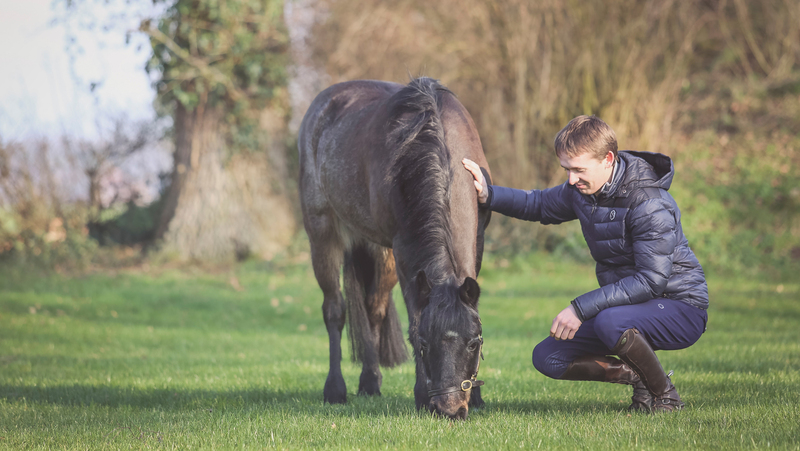 The very best riders in the world are no exception, and a couple of weeks ago we popped over to Irish superstar Bertram Allen’s yard in Germany where we were thrilled to meet ‘Magic’, a very special 27 year old pony who was also clearly the boss of the stables. Can you remember the first time you sat on Magic, all those years ago? I was only 9 years old when I first rode him - and I didn’t fall off! We got on like a house on fire straight away. So you knew there and then that he was the one for you? Yes exactly, we clicked instantly. He’s his own special character! I rode him for two or three years, then two of my sisters rode him, before [my brother] Harry took over the reins - we all had great fun with him. He’s very human like, you can nearly talk to him. He knew he was good, he had more experience than us at the time, so it felt like he was teaching us really. He’d been around for ages, Darragh Kenny used to ride him before us, so he was a fantastic schoolmaster. He used to love his job - he used to be a touch crazy! After he’d finished his round it’d take you two laps of the ring to slow down, especially when he knew he’d done well. He was pretty well behaved though, even if a little strong for a then 9 year old kid. He always wanted to do his best and loved winning; prize givings where when he was at his happiest. Haha, yes! He would have been about 14 years old when I had him, and I was 9, so he taught me plenty. Still does probably! Now though he has free range of the yard at your stables in Germany, and he lives the life of luxury alongside your Grand Prix horses such as Molly Malone, Hector and Izzy by Piccabello. Why did you decide to keep him once you’d grown out of him? Two reasons really; he was a special part of our family and had done a lot for us, so it was our turn to look after him. And when Harry finished competing him he would have already been in his 20s, so it’s not like he would be able to go and help someone else learn the ropes. To be honest, him not being a part of our family never really came into the equation. He was living in Ireland, with all our other ponies there. I came out to Germany and had just two or three horses. When Jessica [Kurten] left the yard it was just us in the whole place, so we thought it would be good to bring him out to be a companion for the horses. I often went to the show with two horses, and left one at home, so it worked out well and he had a good purpose doing that. Now of course we have a lot more horses here, so he’s not needed for that any more, but he’ll definitely be here for the rest of his days. Would you say he played a massive part in getting you to where you are today? Even if it was simply lighting the fire of you wanting to pursue show jumping as a career? Yes exactly. He definitely gave me the bug. He was so competitive, he really got me to a high level where I could be winning week in, week out. Ireland and England are a little different to many other countries - we learn to win and have fun on the ponies before we learn the rest of it. And I think that’s a great way and it’s what gets so many people interested. If you’re able to be competitive and have fun, and be in with a chance of winning, it fuels a passion to keep on trying and working hard. I imagine many might have given up had it not been for that spark at the beginning. That’s true, there’s so much fun you can have at Pony Club, with gymkhanas, games and competitions all directed at young riders and ponies. It’s a lot more about learning just to be with the horses and growing up together. What would you say to any of the young riders who are currently in that phase of their lives? You just have to be as competitive as you can and always keep trying to do your best, even if you can’t win. If you can be third instead of fourth you should always go for it. Find ways to improve and most of all enjoy it. If you’re doing that and you’re still competitive after a few years then you can take it even more seriously and look into as a career. The priority when you’re a kid is to enjoy it, spend time with your friends at the show, love your pony and do your best. Obviously you have to work hard, and look after your pony, but you should go out, enjoy it, finish as high as you can but not take it too seriously. It’s about having fun, but it’s about learning your pony and creating a relationship with them. Magic was in your family so long, you all knew him inside out and vice versa. It’s everything. And it’s true even to up to the level we’re competing at on the Global Champions - probably even more true. We spend so much time with them, and we rely on them for so much, so the more you know about them and the more they know about you the better you’ll be together. You can read them, learn from them and they learn from you so you both know what to expect, where you can push, where you need to back off… It’s definitely the partnership that counts.